The author begins with a general survey of British aircraft manufacturing in the inter-war period. Policy, production, finance and contracts are examined, and the final chapter is concerned with the mobilization of the aircraft industry in 1939, and the emergency measures of 1940. 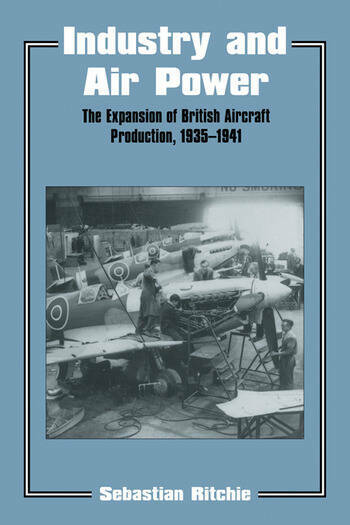 American Aviation Historical Society - "This is an in depth study of the economic and industrial foundation of World War Two British air power... this book belongs in you library." The British Army Review - "highly recommended to anyone who is interested in the interaction between defence and industry, and the implications for the wider aspects of defence planning. Its lessons are entirely relevant to today, and are not limited to the aerospace field"
Aeromilitaria - "...a comprehensive guide to the problems and eventual achievements of aircraft production." Business History - "This is an excellent piece of origionl research, the conclusions of which are articulated in a detailed and convincing style." Military History - "Sebastian Ritchie is to be commended for a fine, thought-provoking, and readable study of what many might feel is a dry and uninspiring"
Aeroplane Monthly - "The result is a scholarly and valuable study that will surely be a standard reference for many years.